Mitsuhiro Yuasa provides an update regarding the current macroeconomic environment in the Japanese equity markets and how he and his team are positioning the E.I. Sturdza Strategic Japan Opportunities Fund accordingly, with a focus on companies with consistent revenue / profit growth and strong management regardless of size, history, brand or market capitalization. Chinese equities update by Lilian Co, Portfolio Manager of the Strategic China Panda Fund with a focus on the opportunities, risks and the macro environment. 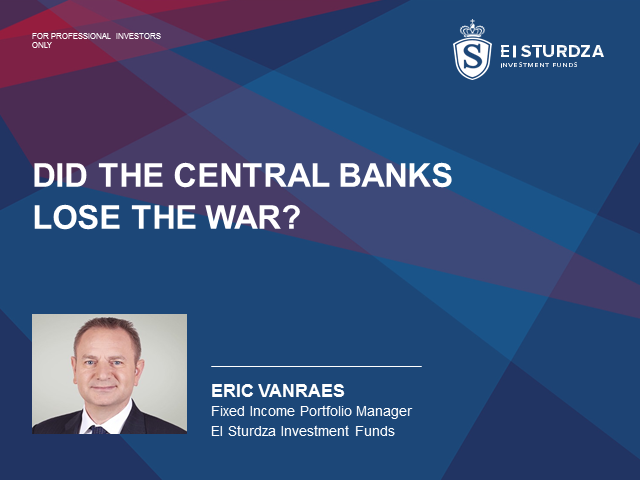 Focus: The current low yield environment and central bank policies that lead to a cruel dilemma - is it still possible to invest in bonds offering both decent yield and quality? Conclusion: It’s possible but predominantly in USD and we believe there are two types of solution, long US treasuries (30y and inflation-linked 30y) and hi-quality emerging markets. Update regarding the outlook for Chinese equities and the positioning being adopted by the Strategic China Panda Fund. 3. How do we manage our Euro and Global bond funds in this environment? · Who will benefit from QE, falling yields and a weaker euro? In this context, Willem will describe how his approach to fundamental research, quality and cash flow, process for valuations and compounding help investors navigate a choppy course for European equities. As Portfolio Manager of the EI Sturdza Nippon Growth (UCITS) Fund, Yutaka Uda will provide insight regarding the opportunities and risks of investing in Japan today. - Europe: a weak euro + weak oil prices + very low interest rates + ECB QE = good surprise on growth before year end?